✅ CAPTURE PICTURES / VIDEO WIRELESSLY ►Perfect wireless solution for taking selfies or recording vlogs without holding your phone / tablet in your hand. Ideal for posting on Snapchat, Facebook, Instagram, YouTube, etc. ✅ LANYARD AND CARABINER INCLUDED ►The neck strap features a detachable ring mount that can be released by pressing a button. With carabiner for attaching the Shutter Remote to your bag, belt, etc. ✅ 30 FT (10 M) WIRELESS RANGE ►Control the camera shutter of your phone or tablet wirelessly from a distance of up to 30 feet (10 meters). ✅ FOR IPHONE AND ANDROID ►This wireless remote control camera shutter will work perfectly with your iOS (6.0 and up) or Android (4.2.2 and up) phone / tablet. 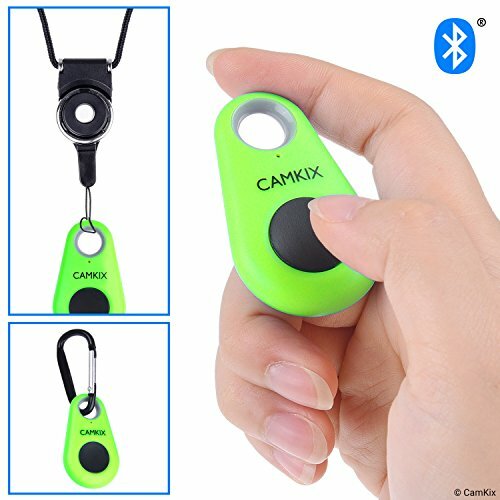 ✅ BLUETOOTH® CERTIFIED ►The CamKix Remote Control Camera Shutter uses Certified Bluetooth® Wireless Technology for maximum reliability and fast operation.